Sold by the individually packaged condom in-store, with 10% discount for 5, and 20% discount for 10. Need more room to 'play'? 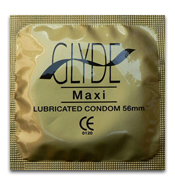 Enjoy ultra sheer sensation and generous room with GLYDE MAXI condoms, which are designed a little bit larger than a conventional Large or XL condom. 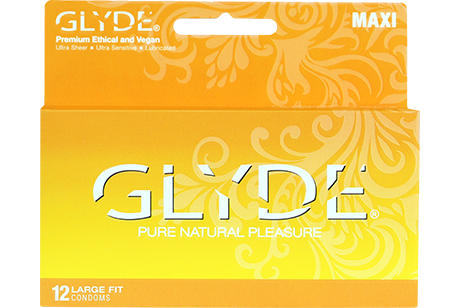 Because GLYDE measures the inner, not outer circumference, our large condoms offer a remarkably comfortable fit. Made with our proprietary blend of a natural plant-based formula of thistle extract and rubber latex, and our patented ‘double dipping’ technology, GLYDE condoms are crafted for performance -- which feels sensational for both partners. Made with our proprietary plant-based formula of sustainable natural rubber latex, and patented ‘double dipping’ technology, GLYDE MAXI is responsibly thin, free of risky chemicals, and crafted for pleasure. Plus, we’ve eliminated any latex odour or taste, so you can focus on the moment. When a condom fits properly it is safer, more pleasurable – and you’ll both perform better. GLYDE’s comfort range includes three sizes made to fit your body while delivering heightened comfort and sensation. The key to comfort, pleasure and safety is a condom that fits. GLYDE has you covered whether you require a slim fit, standard or large condom – all extra sheer, silky and strong with a barely-there quality. You’ll quickly notice our condoms feel natural and perform reliably, even during the most adventurous play, as our patented technology produces a thin sheath with exceptional heat transfer for a more natural experience you’ll both enjoy…again and again. Body-friendly by design, GLYDE are glycerin-free, paraben-free and void of all risky chemicals including talc, nonoxynol-9 and benzocaine. GLYDE condoms are made with a proprietary blend of premium natural rubber latex and thistle extract, eliminating casein – a dairy-derived ingredient used by many conventional brands – which means we’re been certified vegan and cruelty-free for over 20 years. An Australian brand founded over 20 years ago, GLYDE is the first ethical, vegan & fair trade condom. Before ‘natural’ and ‘sustainable’ became marketing catchphrases, we’ve always sourced the highest quality materials from suppliers who operate with ethics– including fair trade labour practices, sustainable rubber cultivation, and using continually evolving methods for cleaner and safer production. Our mission to craft a more natural condom started with eliminating animal products (casein) and opting for a purely plant-based formula of natural rubber and thistle extract. The rubber we use is sustainably harvested by one of the oldest owner-operated farms in the region, where the workers are stakeholders and paid a living wage. By sourcing locally, we’ve reduced our carbon footprint. We’ve kept our packaging simple and eco-friendly – made with 100% recycled paperboard and vegetable inks. No wasteful cellophane or plastics involved. Ever. Our ingredients are sourced from worker-owned and operated producers with fair trade and labour practices, including providing fair and equal pay for men and women. Our natural rubber is grown sustainably, indigenous to the region, and within close proximity to our manufacturing facility – which minimizes our carbon footprint. GLYDE’s consumer packaging is made with recycled materials, soy and vegetable inks. Our certifications include The Vegan Society, PETA’s Caring Consumer Program, Etiquette, the Green Business Network and B Corp.